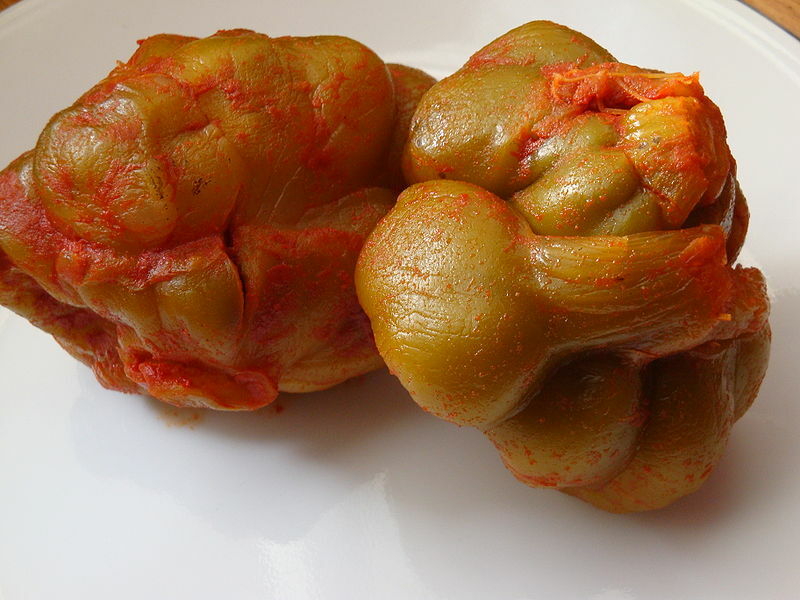 Zha cai (literally "pressed vegetable") is a type of pickled mustard plant stem originating from Sichuan, China. In English, it is commonly known as Sichuan vegetable, Szechwan vegetable, or Chinese pickled vegetable (although all of these terms may also refer to any of a number of other Chinese pickles). Left: Whole heads of zha cai coated in chilli paste. The pickle is made from the knobby, fist-sized, swollen green stem of Brassica juncea, subspecies tatsai. The stem is first salted, pressed, and dried before being rubbed with hot red chili paste and allowed to ferment in an earthenware jar. This preservation process is similar to that used to produce Korean kimchi. The taste is a combination of spicy, sour, and salty, while the aroma is similar to sauerkraut with hot chili paste. Its unique texture—crunchy, yet tender—can only be vaguely compared to Western pickled cucumbers. Zha cai is generally washed prior to use in order to remove the chili paste and excess salt coating the preserved vegetable. Depending on the region and the brand, the flavor can be on the sweet, spicy, salty, or sour side. Although originating in Sichuan, zha cai is also used frequently in the cuisines of southern China, particularly in a soup made with ground pork and mifen, and also as a condiment added to rice congee. It is generally sliced into thin strips and used in small amounts due to its extreme saltiness, although this saltiness can be tempered somewhat by soaking the strips in water prior to use. A popular Chinese dish featuring zha cai is "Noodles with Zha Cai and Shredded Pork".